From specialty grocers to big-name supermarkets, here’s where to stock up on food and essentials when visiting the Blue Mountains. Eating at restaurants and cafes in the Blue Mountains is part of the fun of coming here, but – let’s face it – sometimes there’s nothing better than tucking into a home-cooked meal when you’re travelling. And if your accommodation in the Blue Mountains offers a kitchen and cooking facilities (as does Luxury Bush Escape – the accommodation I provide) you can do just that. But where does one conveniently buy foodstuffs and other bits ’n bobs in the Blue Mountains? Since Luxury Bush Escape is located in Bullaburra in the mid-Blue Mountains, this article will focus on the mid- to upper-Mountains (Hazelbrook to Katoomba). And since I support locally owned businesses I will list smaller grocers first and supermarkets at the end of the article. If staying at Luxury Bush Escape the closest shops are in Lawson, but you might find it more convenient to buy things when visiting Wentworth Falls, Leura or Katoomba. All mentioned Blue Mountains independent grocers have free parking available nearby. Hazelbrook shops are located on the north side of the Great Western Highway and include a Foodworks (mini supermarket), a butcher, a fresh produce store, bakery, chemist and an excellent deli for smallgoods and quality cheeses. 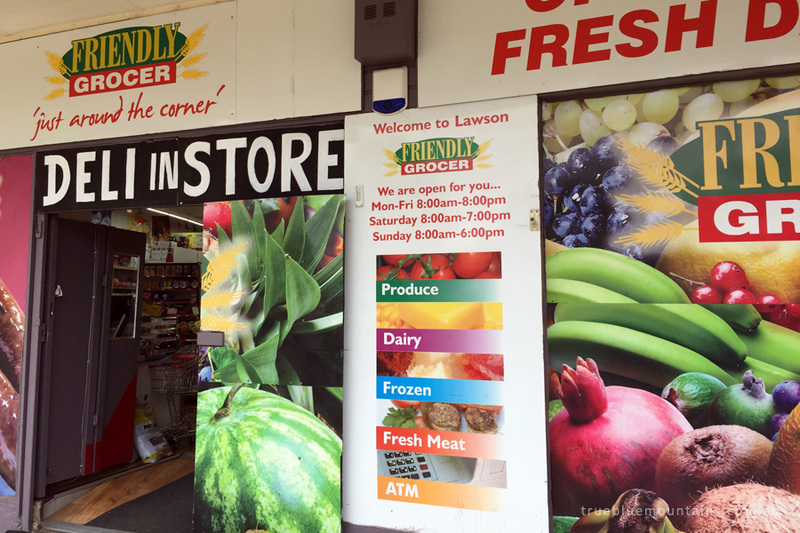 Lawson shops on the south side of the Great Western Highway (Honour Ave) include Lawson Friendly Grocer (which always has classical music playing! ), a chemist and a pub. Head through the tunnel underneath the railway line to find organic produce store, Pantree Produce, at Lyttleton Stores. Located on Station St, the shops in Wentworth Falls include two grocers, a butcher, fresh produce store, an Asian grocer, a bakery, chemist and a handful of restaurants and cafes. As well as having the highest concentration of supermarkets in the Blue Mountains, Katoomba is home to an organic and local produce store, and this region’s fresh-fruit-n-veg institution: Todarello’s. All supermarkets listed below have free parking available, including underground parking.